Universal Law of Attraction quotes are useful guidance to help understand the natural law of attraction to achieve an abundance of love, happiness, joy, health and wealth in your life. The quotes on this page are all from sources and authors with surnames beginning with D through to F.
However small the chance might be of striking lucky, the chance is there. The chance had to be there. If you are good.. Life is good. If you have good thoughts they will shine out of your face like sunbeams and you will always look lovely. I’ve heard tell that what you imagine sometimes comes true. Well, maybe it started that way. As a dream, but doesn’t everything. Those buildings. These lights. This whole city. Somebody had to dream about it first. And maybe that is what I did. I dreamed about coming here, but then I did it. A thought planted in the mind and nourished by the breath, takes root in the heart of every cell in the body. Healing begins in the moment a life-enhancing thought (an affirmation) is chosen to replace a life-diminishing thought, no matter how you may be feeling... no matter how much energy is moving or not moving in the body. Thought plus energy creates results in the physical. We may not always be able to choose how we feel, yet in every moment, we have the power to choose what to think and speak, and in so doing, we choose how to use our feeling energy. The love of God, unutterable and perfect, flows into a pure Soul the way that light rushes into a transparent object. The more love that it finds, the more it gives itself, so that, as we grow more clear and open, the more complete they joy of loving is. And the more the Souls who resonate together, the greater the intensity of their love, for mirror-like, each Soul reflects the others. We are all affecting our world every moment, whether we mean to or not. Our actions and states of mind matter because we're so deeply interconnected with one another. Working on our own consciousness is the most important thing that we are doing at any moment, and being Love is the supreme creative act. Don't be afraid of the space between your dreams and reality. If you can dream it, you can make it so. I am doing things that are true to me. I think the thing to do is to enjoy the ride while you're on it. If there's any message, it is ultimately that it's okay to be different; that it's good to be different, that we should question ourselves before we pass judgement on someone who looks different, behaves different, talks different, is a different colour. The quality of your life is determined by the clarity of your connection to yourself. Your commitment to honouring your perfection and potential is the key that opens the door to endless days of vitality, abundance and love. Your connection to your health and spirituality is not sourced from your identity or your mind. It is sourced from the Soul. This deeper place - your authentic Soul Signature - is where we have to go to find the truth of your being. Your love reverberates throughout the entire Universe. Your Soul Signature is your spiritual DNA - who you are at your core, the most authentic part of you. When we begin to tap into our inherent power, step out of the shadows of fear and self-doubt, and begin living and speaking our truth, we're healthier, happier and in harmony with ourselves. Experience is the child of thought and thought is the child of action. Abundance is not something we acquire. It is something we tune into. There's no scarcity of opportunity to make a living at what you love. There is only a scarcity of resolve to make it happen. Feelings of passion, pure bliss, reverence, optimism, trust and illumination indicate that your desire to manifest success and abundance has an extremely strong pulling power from the universal source to you. 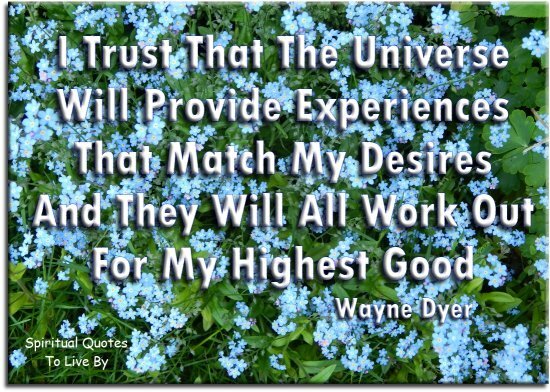 I trust that the Universe will provide experiences that match my desires and they will all work out for my Highest Good. If you believe it will work out, you'll see opportunities. If you believe it won't work, you will see obstacles. If you would like to accomplish something, you must first expect it from yourself. In order to attract and maintain romantic and spiritual partnerships, you must be what it is that you're seeking. That is, you always need to put forth what you want to attract. It's not what is available or unavailable that determines your level of success and happiness; it's what you convince yourself is true. 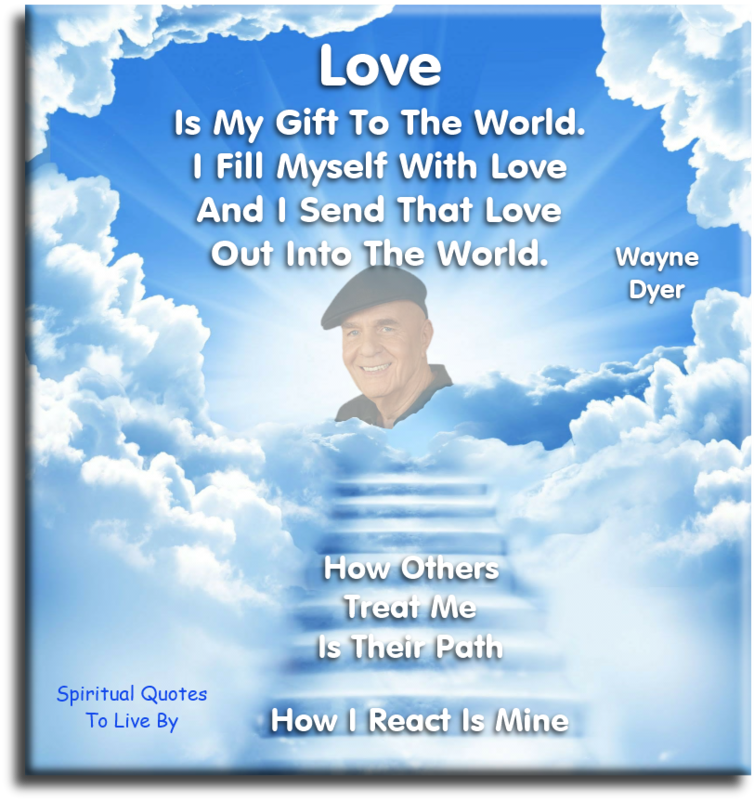 Love is my gift to the world. I fill myself with love and I send that love out into the world. How others treat me is their path. How I react is mine. Loving people live in a loving world. 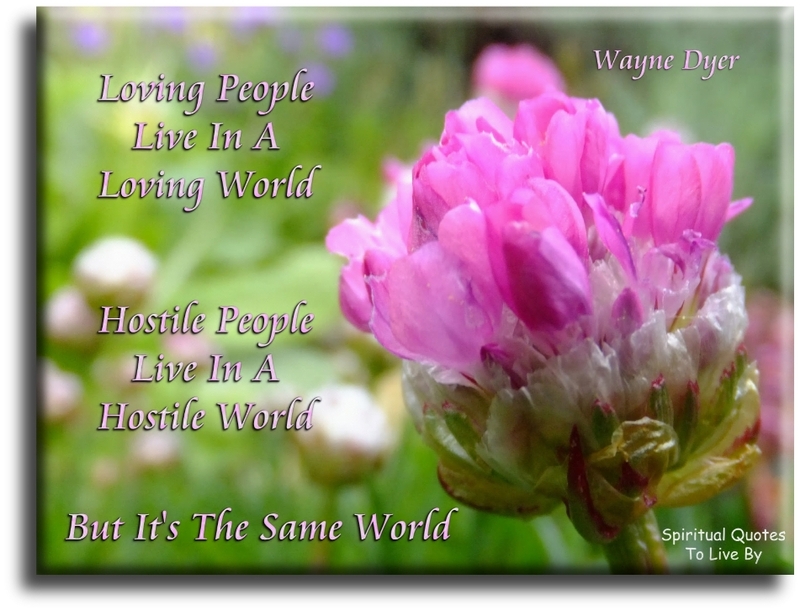 Hostile people live in a hostile world. But it's the same world. Name it... and if you can dream it... you can achieve it. The more you see yourself as what you'd like to become, and act as if, what you want is already there, the more you'll activate those dormant forces that will collaborate to transform your dream into your reality. The only limits you have are the limits you believe. There is no actual stress or anxiety in the world, your thoughts create these false beliefs. Treat yourself as if you already are what you'd like to become. Truly believe in the potential for humans to live in peace and be receptive to all, and you'll be someone who's at peace and receptive to life's possibilities. You can make your life into a grand ever-evolving work of art. The key is your thoughts, the wondrous invisible part of you that is your spiritual Soul. 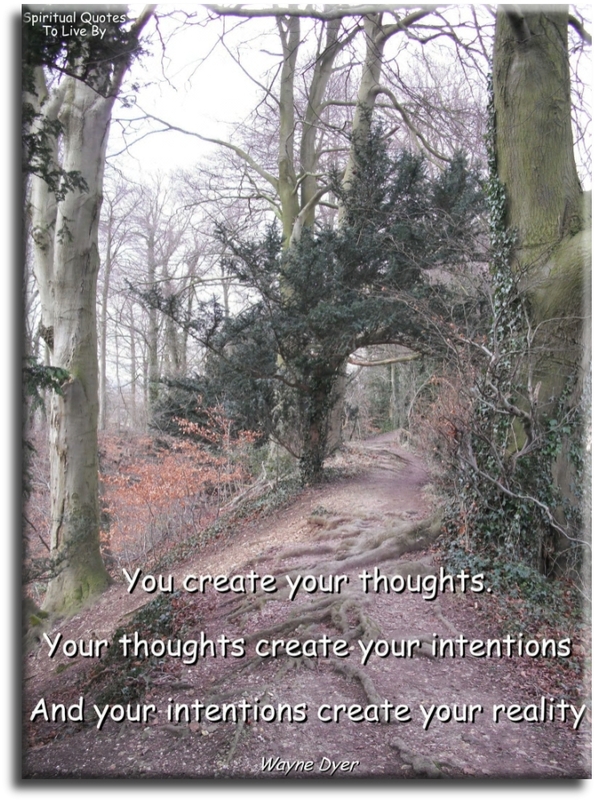 You create your thoughts, your thoughts create your intentions, and your intentions create your reality. 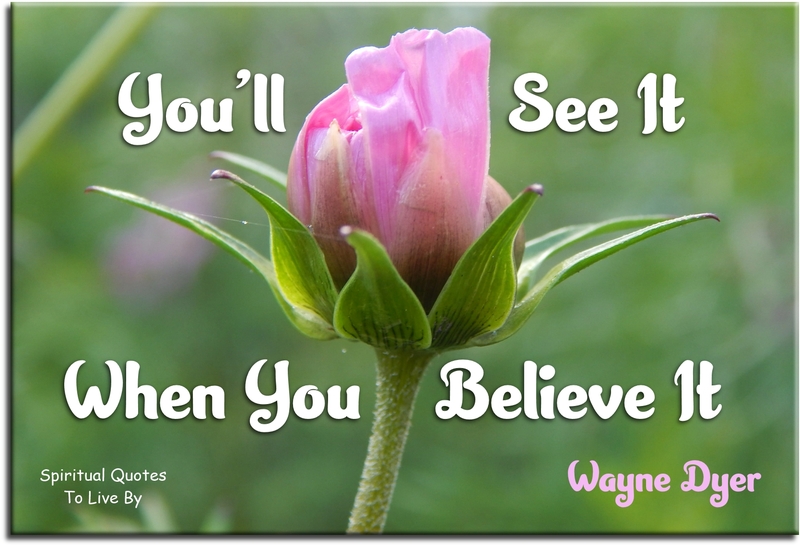 You'll see it... when you believe it. Good fortune is what happens when opportunity meets with planning. I admit thoughts influence the body. The intellect has little to do on the road to discovery. There comes a leap in consciousness, call it intuition or what you will, and the solution comes to you and you don't know how or why. No matter who we are or what we are trying to accomplish, achieving always begins with our believing. 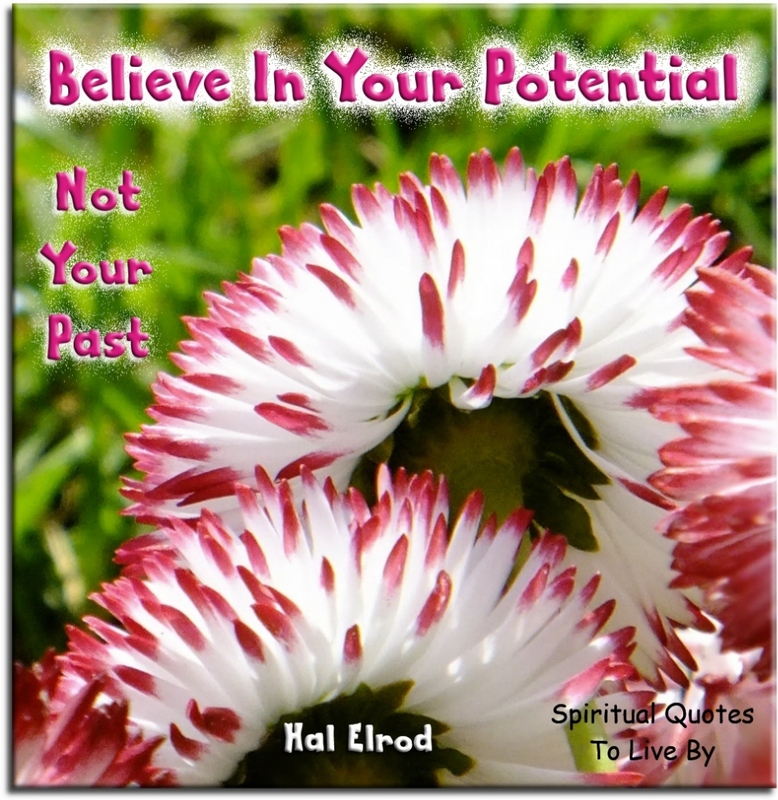 Believe in your potential... not your past. Have faith in the magic and miracles of life... for only those that do, get to experience them. I can't think of anything more empowering than the fact that we are destined to be, do and have anything we choose. The moment you accept responsibility for EVERYTHING in your life, is the moment you gain the power to change ANYTHING in your life. When you live with integrity and value your word over your excuses, you have the power to speak your dreams into existence. Where you are is a result of who you were, but where you go depends entirely on who you choose to be. Who you're becoming is far more important than what you're doing, and yet, it is what you're doing that is determining who you're becoming. You are where you are because of who your were, but where you go depends entirely on who you choose to be. A man is... what he thinks about all day long. Beware of what you set your heart upon... for it shall surely be yours. Cultivate the habit of being grateful for every good thing that comes to you and to give thanks continuously. And because all things have contributed to your advancement, you should include all things in your gratitude. The ancestor of every action... is thought. Thought is the blossom, language the bud, action the fruit behind it. To different minds, the same world is a hell and a Heaven. First say to yourself what you would be and then do what you have to do. He is a wise man who does not grieve for the things he has not, but rejoices for those which he has. Every part of everything is THE GOD SELF… resonating on/at different frequencies of Vibration. You demonstrate love by giving it unconditionally to yourself. And as you do, you attract others into your life who are able to love you, without conditions. I send out thoughts of love and peace and healing to the whole Universe: to all trees and plants and growing things, to all beasts and birds and fishes, and to every man, woman and child on Earth, without any distinction. We affirm the harmony that we seek in order to provide the subconscious with a blue print of the work to be done. We build in thought the conditions that will later come into manifestation on the physical plane. What we experience is our own concept of things. That is why no two people see quite the same world, and why, in many cases, different people see such different worlds. To put it another way, we make our own world by the way in which we think; for we really do live in a world of our own thoughts. Whatever you experience in your life is really but the outpicturing of your own thoughts and beliefs. 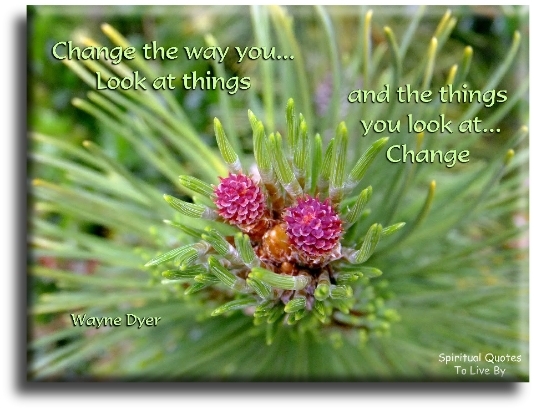 Now, you can change these thoughts and beliefs, and then the outer picture must change too. The outer picture cannot change until you change your thought. I try to live with the idea that karma is a very real thing. So I put out what I want to get back. The more authentic you are, the more clean energy you put forth. Who you associate with shapes who you are. How do we stop racism? Stop talking about it. I'm going to stop calling you a white man, and I'm going to ask you to stop calling me a black man. You never change something by fighting the existing reality. To change something, build a new model that makes the existing model obsolete.